[UPDATE: This post has been re-published in slightly-modified form at the Tikkun Daily Blog.] At the beginning of this past semester, I was invited to read Diana Butler Bass’s Christianity After Religion. I attend a small seminary, and it seems that this book was suggested as a way to encourage the vast majority of students who are clergy-in-training to confront the reality that religious institutions have lost both influence and respectability over the last 5 decades, to say nothing of the 2 centuries before that. The world has changed; and as they say: change or die. Bass–and by extension, my seminary, or at least whoever is in charge of suggesting preliminary reading material [UPDATE: a faculty member has informed me that the person who selected this book actually did not agree with much of what it contains. The discussion we had during orientation did not touch on any such disagreement, however, which led to my confusion on this. Of course it’s great to read things one disagrees with, but it’s also good to point out problems and errors in assigned reading! ]–seems to have a very clear idea of what the Church must do to remain relevant to modern people, and she lays down the challenge, as she sees it, and her proposals for meeting that challenge. Simply put, I was unimpressed. To be both more honest and less generous, I was amazed and appalled by the shallowness of her analysis and the obvious pandering of her proposed solutions. Let me get to some details. Bass is, essentially, a supporter of the “Spiritual but not Religious” line of thought. In short, proponents of this attitude want to pursue a personal spiritual “quest” but are uninterested in religious institutions, rules, or communities. 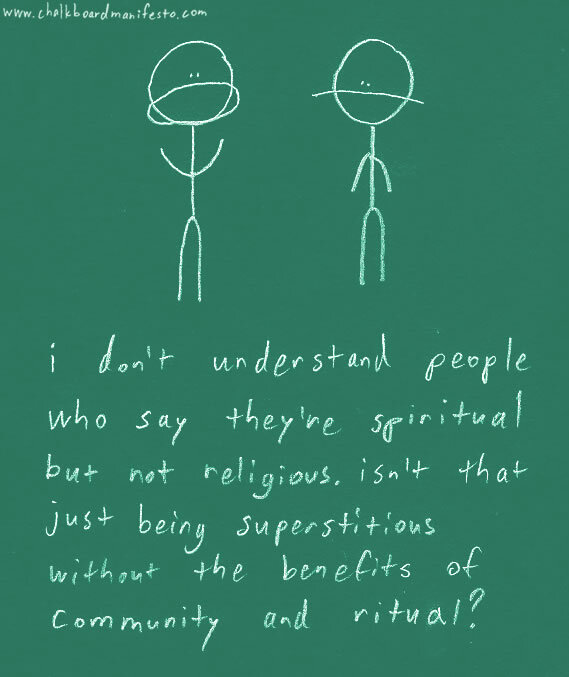 This is a simplistic description, but this is part of the problem: the spiritual-but-not-religious attitude is itself a gross oversimplification, as if spirituality and religiosity were two distinct modes of action or being that one could pursue independently of each other and a whole host of other cultural, social, and political practices. It seems to be a reaction against a traditionalist, conservative, rule-obsessed 19th century Protestantism. But is a rejection of this specific type of religiosity a rejection of “religion” altogether? It seems to me that only someone who had barely reflected on the issues at hand could actually answer yes to this question. Bass spends considerable time in her book exploring what these words “spiritual” and “religious” mean to various people (pp. 68-71), and ultimately ends up admitting that the two words have such varied and diverse connotations that distinguishing between them is hard. In fact, in chapter three, she admits that post people want to be both spiritual and religious (p. 93). Nonetheless, throughout the rest of the book, she continues to operate with a hyper-simplistic and uncritical attitude that the two are diametrically opposed. Part of the problem with Bass’s approach is the confusion between description and prescription. Is she simply telling us truths about the reality of the world? Or is she exhorting us to change our ways? Of course, the one could very well lead to the other, but the relationship between them shouldn’t be taken for granted. Take, for example, pollution. One might describe the reality that our world is increasingly polluted, and thereby recommend or prescribe moving to an unsullied mountain range, buying a hazmat suit, or investing in pharmaceutical companies making anti-cancer drugs. This is all perfectly logical, but there is a wholly different sort of response: maybe we should try to stop polluting the place we live in. So when Bass basically describes a modern world filled with people only interested in convenient, overly-optimistic, individualistic ersatz “spirituality”, is she simply telling church leaders how things are? Or is she recommending that we join the bandwagon? Personally, I would agree that this process is occurring, but I don’t think it’s a good thing, and I would call on the Church not to simply concede that people are no longer interested in what we do and therefore that we should completely change our mission. I would call on the church to be critical of something if it seems bad. Of course, I’m not suggesting an inflexible traditionalism. We absolutely must be willing and able to respond to modernism. But that doesn’t mean giving in completely to it; modernism has both good and bad aspects. Let’s humbly accept the former while calling the latter what they are and resisting them. I support women’s ordination, the ordination of homosexuals, Christian engagement with environmentalism, theological engagement with modern philosophy, dialogue with our atheist and secular fellow citizens, and a full recognition of the separation of the church and state. These are all certainly modern developments, and I’m glad that the Church has been forced–and it was forced–to accept these critiques. But modernism has also brought all sorts of bad things, and I want to be able to point those out, and hope that the Church will resist them. Science has brought all sorts of realy great things, but it’s also brought pollution, atomic weapons, and global warming. Modern society is much more tolerant than societies past, but it is also often extremely lonely and alienating. Capitalism has brought lots of choice at the cash register, but it’s also brought incredible exploitation and suffering for working-people. So let’s, by all means, accept the modern developments that seem good to us–and let’s fight the good fight against all the evils modernism has also brought. There’s no inconsistency here; plenty of things have good and bad aspects. And building a better world means discerning between the two. So, when it comes to the spiritual-but-not-religious (this is getting arduous to write, from now on I’ll acronym-ize this SBNR), what does this mean? Well, Bass herself links the increasing desire for ‘spirituality’ with the development of consumer capitalism (eg. 41-43). It seems clear to me that the SBNR is the religio-spiritual manifestation of late consumer capitalism. It’s totally individualistic, and sees the Church/religious institutions as essentially businesses. Bass seems to be pointing out that these businesses are providing a ‘product’ that fewer and fewer consumers want–so why not change the product offered? That’s certainly the logic of the market. If Kellogg’s noticed that a cereal wasn’t selling well, it would be discontinued or changed, because that’s how the company can make more money and keep its shareholders happy. But isn’t this sort of mercenary decision-making precisely the sort of thing that SBNR people would find offensive? The irony is that late consumer capitalism has so impoverished our sense of real community and the presence of Spirit that we are searching for individualized, customized, comfortable, convenient “spirituality”, even though it’s the very pursuit of this sort of thing that has impoverished us in the first place! Spiritual transformation is not a matter of finding an easy fit, a fun new practice, or following a trend. “Take up your cross and follow me” is not the sort of tagline you can put on a new yoga exercise or some new meditation technique (I am by no means dismissing yoga or mediation, which are ancient spiritual practices, but rather the insipid versions of these peddled by all-too-many Western entrepreneurs). It is a radical call to abandon every false sense of security, every false confidence we have, and trust radically in the mystery of God. Christianity, taken seriously, is intensely radical. I find SBNR so frustrating and aggravating precisely because it is hopelessly boring, so incredibly mainstream: it’s precisely what capitalism does to religion and spirituality. Lenin supposedly once said that capitalists would sell him the rope he’d use to hang them. Modern westerners will try to buy the very spirituality they so desperately search for because they have become totally consumer-ized. It’d be funny if it weren’t so damned sad. Now, none of this means that Bass is wrong descriptively: she’s absolutely right to point out that this trend is happening and she is absolutely right that the Church must respond to it. But I would argue that we need to do exactly the opposite of what she proposes. I think that these various trends and fads–this hyper-individualistic, consumable ersatz spirituality–will flash and burn out like many trends before it. What people are really looking for (and I say this as someone who spent years looking myself!) is an authentic, enriching, challenging spiritual community. I’ve chosen each of those adjectives quite intentionally. The problem with SBNR is that it is none of them. It’s not the least bit authentic; SBNR practices tend to smack of a cobbled-together New Ageism. It’s not enriching, because it seeks to give a sort of shortcut for spiritual fulfillment, which is a complete contradiction in terms. And it’s not challenging because it simply reinforces our own narcissistic and self-congratulatory reflexes. It’s true that we often need to be kinder to others and even ourselves. But it’s also sometimes true that we need to be called out, be held accountable. The road to Hell, they say, is paved with good intentions. SBNR is full of good intentions–but little else. Finally, SBNR is in no way a community–it explicitly rejects community when it rejects religion. In seeking a spirituality that is personalized, individualized, and reassuring, we necessarily exclude a community. Of course, one of the problems with any community is that people–most of all other people, as Oscar Wilde pointed out–are so often boring, arrogant, needy, and upsetting. The trick, of course, is to realize that you are Other People to other people, and those same traits doubtlessly describe you. A religious community can keep us accountable, and it can keep us humble, and it can save us from the Great Adversary–our own high opinion of ourselves. Of course, this doesn’t mean we should accept the discipline of a community uncritically–and of course, many religious communities have been unduly, even unjustly harsh, intolerant, and oppressive to lots of people in the past. But SBNR is no magic bullet; it simply trades one danger for another–and it’s all the worse because it reflects all that is worst about late consumer capitalism. I am not suggesting that we be Religious but not Spiritual–I’m asserting what past generations, I think, took for granted: if one wants to be spiritual, one must be religious–and vice versa. They don’t work apart from each other. Spirituality without religion is a convenient, comfortable, self-congratulatory illusion; religion without spirituality is stale, dogmatic, and dead. Bass and other SBNR proponents have, I think, been so fully immersed in the logic of capitalism and modern individualism that they cannot understand any other way of looking at the world–even though this modern viewpoint is diametrically opposed to the very spiritual enrichment they so desperately seek. The main takeaway of all of this, for me, is that much of what Protestantism discarded with in the 16th century–the sacramental, sacred, engaged, community-focused rites of medieval Catholicism–is precisely what modern Christians are yearning for without knowing it. Again, let’s not oversimplify: the Reformation was right to challenge the ecclesial abuses and warped theology of indulgences of the time. But I think in many ways, the baby was thrown out with the bathwater. Protestant Christianity became a wholly intellectual, private affair, a sort of legal transaction between God and an individual human being–instead of the loving, mysterious embrace of creation by Creator. But the solution is not some sentimental, anti-intellectual New Age nonsense. It’s a restoration of a balance between reason and emotion, devotion and theology, sacrament and study. For Christians, I think this begins by endeavoring to explore deeply what the Real Presence of the Eucharist means. This does not have to translate into acceptance of the doctrine of transubstantiation (it certainly doesn’t for me) but it means rediscovering the spiritual riches of our religious practice. The alternatives are a dead religiosity or a superficial ersatz spirituality. May the Holy Spirit guard us from both. This entry was posted in Book Reviews, Modernism & Post-Modernism, Theology by Noisy Gong. Bookmark the permalink. I had the (mis)fortune of seeing a snippet from “The Secret” the other day, which, if you’re not familiar, is pretty much SBNR taken to its full-on capitalistic extreme. Hilariously over-produced, egregious, and almost offensive (even to a non-religious nor spiritual person such as myself), it was pretty amazing how self-centered it was at the heart of it all.